MONTREAL - The mummified head of a Maori warrior, the last one believed to be in the possession of a Canadian museum, is on its way home. The remains of the male warrior with tattooed skin were handed over to authorities of a New Zealand museum in a traditional ceremony Wednesday. 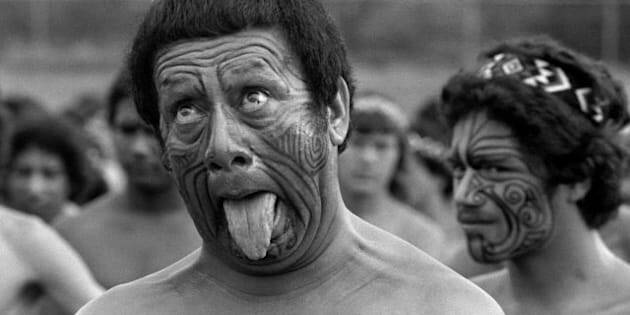 In keeping with the tradition of the Maori, the indigenous people of New Zealand, the ancestral head was not permitted to be filmed or photographed. But the relic was visible to the handful of people attending the ceremony. Laying under a sheer black cloth, it was wrapped in cellophane and packaged in a series of protective boxes for transport. All the while, a group of Maori chanted, prayed and sang during an emotional ceremony. Maori officials said they have spent a quarter-century trying to have human remains removed from display around the world and returned home for a proper burial. In the 19th century, Europeans became enamoured with the heads and the Maori began using them almost like currency to trade for muskets and other coveted objects. While some were sold and traded, others were stolen because of their value as curiosity items. "Before, they were received as works of art. They were people and they are people," said Michelle Hippolite, co-director of the Museum of New Zealand. "In our culture, remembering that they are people first is what is most important." The head that ended up in Montreal was obtained by F. Cleveland Morgan in 1949 at the Berkeley Galleries in England, before being donated to the museum. The Maori estimate that they have retrieved about 320 of the 500 known remains around the world, located in 14 different countries. That doesn't count private collections, but some collectors have come forward after hearing about the campaign to repatriate the heads. All the known Canadian ones have now been retrieved. Many museums have been more than willing to return the artifacts, called the Toi Moko by the Maori, but some have balked. Rahui Papa, a cultural expert and a member of the tribal group on hand Wednesday, said those museums have argued that they own the heads or that they were part of larger collections donated to them and shouldn't be returned without consent. "Some believe they are their property and they're not willing to relinquish them even to the ancestral home from where they came," Papa said. France's culture ministry blocked an attempt by a museum to return a head in 2007, fearing that it would create a precedent for other cultural items in museums across the country. In 2010, France passed a special law allowing the repatriation of Maori heads, including that one. Hippolite estimates that recovering all the known remains could take another decade or two. Wednesday's ceremony at the Montreal Museum of Fine Arts marked the fifth and last Canadian head to be returned from a museum in this country, said Nathalie Bondil, the museum's director. The other heads, located at the Canadian Museum of Civilization and the Royal Ontario Museum, were returned in 2008. The Montreal artifact dates back to the 19th century. It was briefly on display at the Montreal Museum of Fine Arts between 1982 and 1984. Since then, the head has been in storage and, last year, the Montreal institution's board voted unanimously to return it. Bondil, also the chief curator, said it was a great relief that the remains would be laid to rest. She said the return of the head should not be viewed as a repayment. "Ownership of the human body is inalienable," Bondil said. "Our board declared it was not restitution, just a return (of the head) to the land of origin." Most of the remains are exceedingly difficult to identify. Experts are able to do so by identifying the intricate tattoos and signature marks. But elders have resisted DNA testing on the body parts, in the interest of maintaining a level of dignity. The timing of the repatriation comes as an exhibit on the Maori people opened at the Musee de civilisation in Quebec City on Wednesday, lasting until September 2013 with more than 150 objects on display. But the 19th century head won't be there. "This ancestor has had a wonderful holiday in Montreal — an extended long holiday, but a holiday all the same," Papa said. "This ancestor is able to return to the shores of New Zealand, to the mountains, to the forests, to the very land from which he once came. "Now we have the opportunity to take him home."